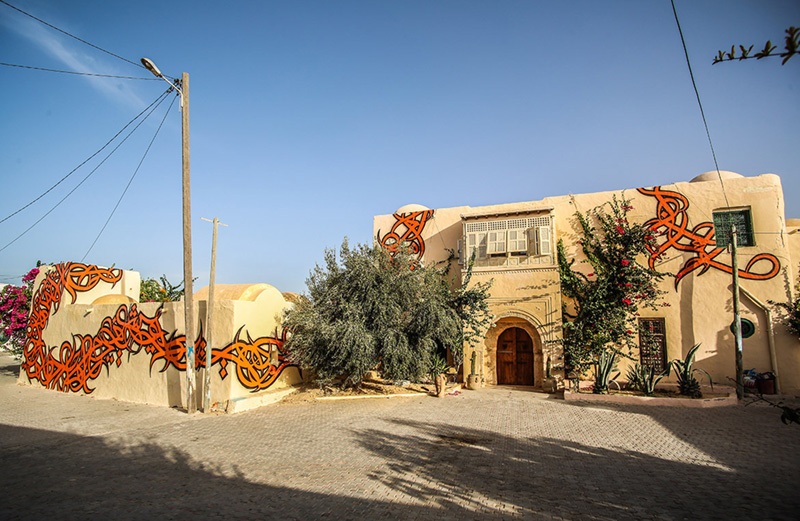 Curated by Tunisian-French art gallery owner Mehdi Ben Cheikh, the street art project Djerbahood invited more than 100 international artists from thirty different nationalities to travel to Erriadh, one of the oldest villages in Tunisia, to create murals. The scenography is fantastic, the ruins transformed into open air canvases where artists like C215, eL Seed (a picture of his work below), Swoon, ROA, Claudio Ethos, Add Fuel, Seth and many others expressed themselves on walls, doors. A great way to promote street art in Tunisia and beyond, and to offer the tourists exploring the island to make a detour to discover the village and thus support the economy of the region. I have to admit, considering my sentimental and nostalgic attachment to Tunisia and particularly to Djerba, and the fact that street art is still part of my artistic expression, Djerbahood is like paradise on Earth. As I wrote in this post right after the death of Mohamed Bouazizi in 2010, I never returned to Tunisia. Maybe Djerbahood will be a trigger. After all, da-eYe was born in the mid-80s on the walls of La Défense / Paris and the Sama from the World of Sama were inspired by dromedaries and camels.